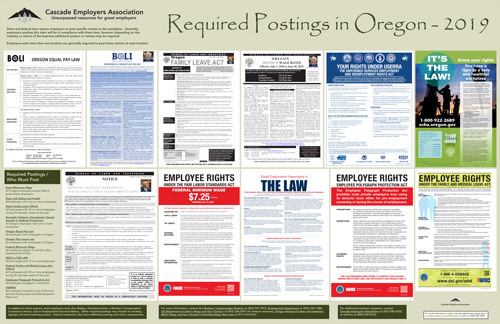 One of the many resources that Cascade offers to employers are all-in-one Employment & Labor Law posters. Regulatory changes require some updates for 2019, so if you use all-in-one posters, reserve yours now and we’ll mail them to you prior to the new year. These posters are available in both English and Spanish, and printed on heavy duty glossy paper or laminated. Keep in mind that the Oregon Minimum Wage will increase in July, 2019. As an added benefit to ordering from Cascade we will send you an easy-to-apply sticker to reflect the change at that time. This is an easy way to keep in compliance with required postings. Pre-order now and you won’t be billed until shipped.